Every now and then I come across a budget beauty product which I genuinely prefer to some of the more expensive options in my beauty drawer. Right now – there are 6! Having recently fallen back in love with the brand Seventeen, (read my review of their Phwoarr Paint here) I’m beginning to notice a common trend – they do great dupes! I’ve also recently been introduced to Sleek, and their new Bare Skin foundation has the lasting power and flawless coverage to beat many designer brands. At just £3.89, you can afford to try out several shades of the Seventeen eyeshadows. Compared to my Naked 3, I would say the colours are not as good, but the lasting power is far better. I am currently loving the shades Rose Quartz and Funfair, which are similar to the shimmering options in the Naked 3 palette. The pigments are very intense so you only need a little on your brush and they seem perfect for blending with their creamy soft texture. I’m soon going to write a full post on the Seventeen Cheek Stamp (you can see the peach coloured pot in the image) but let’s just say this cute little container packs a big punch – and the shade is identical to Nars Amour, even with the subtle flecks of shimmer. I’ve been quite lucky with my skin recently that I’ve not had too many blemishes, but the Seventeen On-Spot concealer has been the one i’ve been reaching for to cover any imperfections. The formula contains blemish fighting salicylic acid, so it fights as well as conceals. I use this under my foundation, patting it lightly onto the blemish area. Another Seventeen product I’m loving at the moment is their Lip Lustre – offering long lasting colour and a subtle sheen. Perfect when you don’t want a dramatic look, but natural lips just won’t do. I keep this in my handbag for every-day top ups. I’m normally the one flying the flag for pricey foundations – I always think they are worth it, but after reading some great reviews for the Sleek bare skin foundation, I just had to try it out. The super light foundation gives a barely there feel, which I love in Summer months; it gives a no-make up look while delivering a super flawless finish. The moisturising properties in the foundation give my skin a lovely glow, and my skin feels nourished throughout the day. My favourite of all the budget buys has to be the Seventeen Falsifeye mascara – I wouldn’t go so far as to say the results are like wearing false lashes, but I love the the brush has long bristles on one side, and short on the other, ideal for separating, coating, and building up long lashes. I curl my lashes before applying 2 coats of this mascara and the result is thick lashes and a wide-eyes look – all for less than £7! 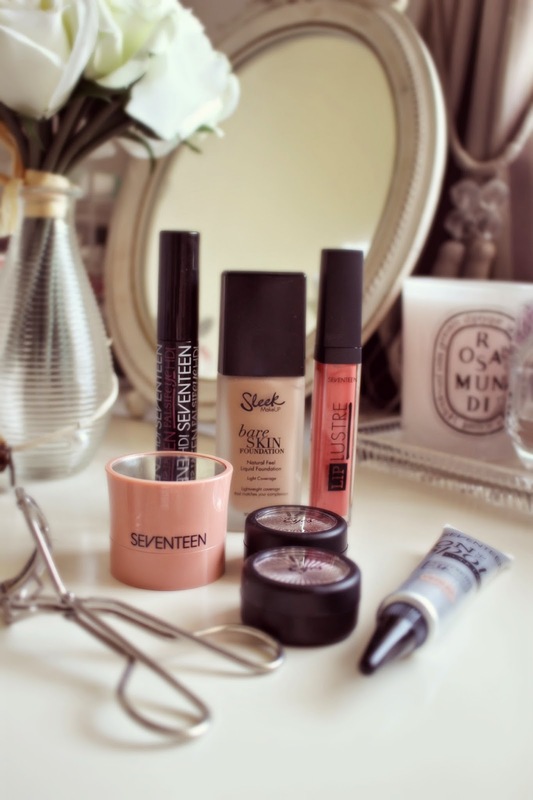 Seventeen and Sleek are both available from Boots & Boots.com.